Is it possible to change the subject? This is urgent. I just read a translation to Spanish, in La Tercera newspaper from Santiago, Chile, of a Dr David Whitehouse’s article, http://www.newstatesman.com/200712190004, arguing that Global warming has, temporarily or permanently, ceased, based on a fact that the “global temperature of 2007 is statistically the same as 2006 as well as every year since 2001”. Where is Whitehouse getting the data from? Is it real? For what I have seen, at least in Europe the 2006-2007 winter was the hottest in 150 years, I published a picture where you can see hundreds of people at a Spain’s beach tanning under the sun, days before 2006 Christmas. Was 2007 the “hottest year in history” as predicted by professor Phil Jones, from the East Anglia University? And finally who is Dr David Whitehouse? I could not find his bio. RE #35 & 22, I do agree with you regarding the science contained in the various articles. Scientists cannot risk being the boy who called wolf. But they really should call wolf if it looks like one is coming. We know how that story ends…the wolf actually came and killed the villagers. Actually I think the villagers, and not the boy, are to blame. I guess what I was getting at is that the reviewers and editors (if not the authors), should be more vigilant of wording and (unsupported) claims that might end up misleading people to believe that GW is not human-caused or is not happening, since there may be greater damage in this. Regular vigilance then should be given to claims that AGW is happening. I know about peer-review. I’m dealing right now with making lots of corrections on an article I submitted, based on reviewers’ suggestions. Some minutely dealing with wording, and some pointing to my lack of evidence or support here and there, which happened when I tried to cut the paper down to the journal’s page limit, and cut out some references…so back go those references & I have to cut down the text somehow. I’m just thinking that the unsupported claim about models should never have passed peer-review (my reviewers would have picked up on it…they’re ruthless). The reviewers seemed to have done a sloppy job. I read the Nature paper. It is an intersesting paper and I agree with you that if the authors had analyzed the CMIP3 output, it would be much better. I also don’t think it is right to say that in the CGCM models the ice (snow) albedo feedback is the main mechanism for polar amplification. we  have recently published a paper and theoretically proved the feedback from heat transport greatly influence the vertical and meridional structure of global warming. It is important to point out the heat transport feedback does not have to warm the atmosphere only, it also can cause a larger surface warming by the concurrent other thermal-dynamic feedbacks. Jorge, no need to change the subject for that, it’s a common story. Haven’t a clue. Doesn’t seem too keen to share it with us, either. Well, you could try looking up the charts. But don’t worry, I will give you one with both the GISTEMP and HadCRU — although I should point out that the chart I am giving doesn’t end with the last few months of this year. 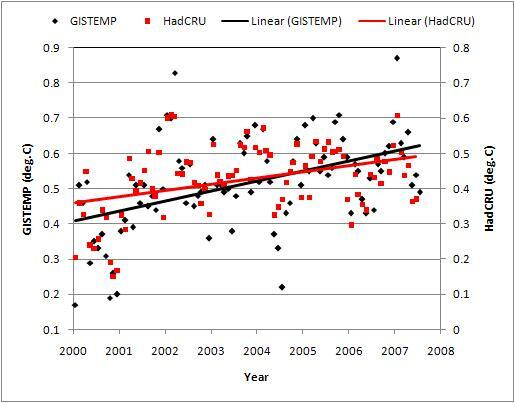 GISTEMP is rising at a rate of 0.28 C per decade, plus or minus 0.19 C per decade. HadCRU is rising at the rate of 0.18 C per decade – plus or minus 0.16 C per decade. It doesn’t look to me like there is the exact cancelation that Whitehouse seems to think there is. As such, it is actually higher than the linear trend you get by going 1975 to present for NASA GISS (0.18+/-0.03 C/decade), but slightly lower than what you get from HadCRU for the same period (0.19+/-0.03 C/decade). I would check out the webpage — to learn a little about what gimmicks people can use when they want to lie with statistics, incidentally. Why the difference between GISTEMP and HadCRU? Mostly because GISTEMP includes the stuff above the Arctic circle but HadCRU doesn’t. The stuff that gets lopped off by HadCRU is where the greatest warming is taking place. The fact that the greatest warming takes place up there is called “polar amplification.” Why does it take place? Well, that actually brings us back pretty darn close to the topic of this post…. You might want to check out my comment 39, though, and maybe even look up the article it references. Why on Earth do you want to go to the effort of translating that drivel. Whitehouse is yet another non-climate scientist who doesn’t understand climate. Yes, the current solar cycle started late. Yes, it looks like it might be a weak one as far as solar activity is concerned. It might even wind up affecting climate somewhat. However, any hiatus in solar activity will end–perhaps in a few years, perhaps a decade or two, perhaps even after 80 years as with the Maunder Minimum. And when it ends, the CO2 will still be there, and it will still be trapping heat, and things will go right on heating up for HUNDREDS of years. Only if we get a hiatus from warming, we will likely lose focus on greenhouse gasses and dump even more CO2 into the atmosphere, making the problem even worse. As to his statistical arguments, he should be ashamed of himself. The trend is still up–and the only way to avoid that conclusion is to cherrypick your starting point. But, don’t let us get sidetracked, right? It’s so easy to do. re your response to 48. One of the neat things about RC is the interdisciplanary weath of things that you would never encounter just reading Science ,Nature and JGR or Eos. Somewhere in the links above one learns that arctic refraction effects can lead to distorted images of the sun being visible 5 degrees below the horizon. If the red shift continues into the IR, can significant amounts of atmospheric radiation be refractively channeled across the terminator into the arctic winter dark , effectively bringing forward the edgewise onset of daylight warming before the arctic spring dawns? This is a shot in the dark question, and i apologize if it is quantitatively irrelevant, because I have no notion of atmospheric dispersion in the IR. Russell, The effect seems to be due to temperature inversions, with greater refraction occurring in the layer of cold dense air, and less in the air above it. The images on the website certainly appear to suggest that blue light will be affected more than blue–consistent with rayleigh scattering. Wouldn’t this suggest that the effect will be less for IR than for shorter wavelengths. So, we’ll see it before it warms us. Also, remember that the Sun is not too bright in the IR. Don’t miss the sunset pictures–one of the best blue-flash photos I’ve seen. RE #51, here is a way of conceptualizing denialist arguments that have been roundly rebutted by science time and time again: ZOMBIE LIES. One aspect is, the conventional wisdom is that the more wrong you are, the more credibility your opinion has about anything having to do with ___ (insert AGW). This might explain why denialist arguments never die, no matter how dead science seems to kill them. Mike, I hope you can say more about the two papers (Cai and Lu, Lu and Cai, they are parts I and II) on theory once you’ve read them. Perhaps you could add the missing verbage that is indicated by the four periods between “feedbacks. ….Much” in your initial comments for the benefit of those of us who do not have a subscription to Nature. I for one tend to become concerned when one questions another’s comment or point of view without citing their comment or point of view in its entirety. It changes nothing that Gavin et al. have commented on. Probably the wrong place but, when is someone going to address the NASA report on sun spots and the prediction of 20 to 30 years of a colder planet? I think they are saying that a whole bunch of hot air will be leaving the web very soon. Ray Ladbury> …even after 80 years as with the Maunder Minimum. And when it ends, the CO2 will still be there, and it will still be trapping heat, and things will go right on heating up for HUNDREDS of years. I doubt that you can support that statement unless you are just talking about a small fraction of present CO2. The half-life of CO2 in the atmosphere is much less than 80 years. John L. Casey looks like a one-man-band apparently pushing consulting services based on some climate theory he has. His address is 4700 Millenia Blvd #175 Orlando FL, and if you Google that, you will discover an amazing number of companies that seem to be located in that office suite. There is nothing obvious in Casey’s background to establish any particular expertise in climate science, no obvious presence in Google Scholar, and nothing before a recent press release. The info sounds like yet another “I’ve discovered cycles” thing, which happens all the time. Of course it could also be another “Carbon dioxide production by benthic bacteria..” scam, albeit on a much smaller scale (and if it is, I apologize in advance if that helps ruin somebody’s joke.) The website is 2 months’ old. Casey’s “press release” isn’t even up to Rob Ferguson’s standards. Casey “confirms” 18-month-old research from NASA, and has comments that certainly sound like Casey being interviewed by his own sock puppets. or http://en.wikipedia.org/wiki/Solar_variation (see first chart especially; as usual, Wikipedia isn’t an authoritative reference, just a good start). All this stuff has been covered at RC many a time. Speaking to the question of anthropoligical effects speeding GW over the arctic. Am I mistaken in my belief that (among other changes) we need to reduce high latitude air traffic during the winter months, when there is little sunlight to reflect and cloud cover tends to trap heat, while possibly increasing it during the summer to increase albedo over the region? or long a thousands of Kilometers, and may in effect cause the sun to disappear in mid air, ie the not so famous Wegener blank strip. hot in UV. Where Rayleigh scattering is quite effective, even so, UV photons have been measured 2 or 3 weeks before the rise of the sun during the long arctic night at twilight (take my word for this, no reference, guys in Antarctica may confirm this). if there is any heat effects at all it would be in the blue and beyond wavelengths, don’t expect it to be huge, but it may be an important extra forcing component especially for the Polar or Antarctic long nights. Citation please? If you’ve come up with your own unique number from personal experiments, show us your method. Else your scientific cite? CO2 is a gift that keeps on giving. Keep in mind that the biosphere does not sequester CO2 indefinitely. In fact, more plantlife can wind up giving rise to more CH4, which has a much higher warming “bump” before it too becomes CO2. Planting trees is at most a delay, not a solution. And the oceans are already diminishing in their ability to absorb carbon. I would think yes, with regard to the second part of your belief. Air traffic anywhere, anytime pumps more CO2 into the atmosphere, and that will be around far longer than, and so, I would think, will greatly outweigh, any possible effect of an increase in albedo so far as warming is concerned. A large part of what leaves the atmosphere will add to ocean acidification. If you’re serious about slowing AGW, don’t fly unless you absolutely have to. Thanks Ray. I was not thinking of solar IR radiation, but the fact that the atmospheric 5 to 15 micron emission may be channeled up and over the apparent horizon just as the solar image is even though it is out of the line of sight. My apologies for making the analogy mistakable for a long wave green flash- I’m wondering instead about the IR dispersion of the atmosphere considered as a pressure gradiated GRIN lens in the vibrational line regime. Dylan, re #64. Actually, no, we’ve had 10 years of misinformed denialists claiming there has been no warming since 1998. 1998 was a big year for El Nino, so it is an outlier. You could look this stuff up on this site if your were so inclined. The problem really seems to be with the AP reporter’s interpretation of the paper. What exactly does the phrase “natural and cyclic behavior” mean? The implication is that natural and cyclic behavior does not involve global warming. In the south, it also appears that melting in the West Antarctic has been accelerating, also according to NASA. Now, if the Arctic and Antarctic are melting, and the equator is not cooling, then there is no way that can be a ‘natural and cyclic process’ not related to global warming! The situation is complicated, but that’s no excuse for simplistic reporting. For example, some recent reports indicate that wind forcing of ice out of the Arctic Ocean is a major factor in the large open-water regions in the Arctic this past summer. However, that doesn’t mean a ‘natural cause’. Thick, broad sheets of perennial ice are resistant to wind forcing – but as the ice thins due to global warming, and sheets break up into fleets of icebergs, the sensitivity of ice masses to wind forcing increases. Anyone who fundamentally doubts that a small initial forcing can have a large effect on a system, out of all proportion to the initial forcing, might want to take a look at this: All fall down. That statement assumes that climate models are absolutely correct on global warming, so that if something happens that’s unpredicted, it must not be global warming, but rather a ‘natural effect’! Huh? That’s on top of the general theme here, the lack of references to actual climate model results in the paper. In that regard, reporters covering climate science might want to look at the following course lecture page, and see if they can answer the questions at the bottom, just to make sure they don’t make any more such embarrassing blunders (which, to be fair, are a more-or-less unavoidable side effect of scientific inquiry). the same way as any visible or invisible light, its a question of direction, how would this IR have momentum such as light from a point source? Re #13 response: At this point, it seems fair to say that all climate-related articles in Nature and Science are for public consumption, whether the authors intend it that way or not. There’s nothing about the problem that couldn’t have been caught and fixed by a non-specia-list editor. The substantive issue of the comparison with the model results aside, the phrasing was still very clumsy. That said, kudos to whichever one of the authors it was that came up with the idea of using that data source. It sounds as if it will be very useful for more than just this paper. Re #71 and others: No need to look elsewhere for a good discussion of CO2 persistence. It seems to me that use of the term “half life” in this context, even if it can be defined, is inappropriate, since the decay is very much non-exponential. Ray Ladbury> Actually it’s over a century. You should read Spencer Weart’s history. We note that the single half-life concept focuses upon the early decline of CO2 under a cutoff/decay scenario. If one assumes a terrestrial biosphere with a fertilization flux, then our best estimate is that the single half-life for excess CO2 lies within the range of 19 to 49 years, with a reasonable average being 31 years. As they say, decline slows after the initial reduction, but 1/2 is likely gone in about 30 years. I have some idea of how to relate dispersion to wavelength in solids where the Kramers -Croneig & Clausius-Mosetti relations hold, but lack any intuitive connection between waveguide theory that presumes a big step function between propagating and reflecting mediqa and gas channels , where the RI and , I assume , the dispersion is ~threeordersof magnitude smaller. For a lossless medium it just scales with distance, so 1000 kilometer pathlength may be realistic,but I’m still clueless as to the scattering freepath – how reflective is the ionosphere at low angles at say 10 microns ? Steve, I am familiar with the Moore and Braswell paper. First, as I said before, the increased plant growth at most delays the issue, as plants eventually die and the CO2 goes back into the air. Neglecting this delay, the time constant they come up with is 92 years. Also, if you have less sun due to a sunspot minimum, you’ll have less plant growth. Second, as David Archer points out in the piece S. Molnar cites (thanks, I’d lost track of where I’d read this), a mean lifetime of several hundred years is more reasonable, but some of the increase relaxes only on geological scales. To assert that we’ll all be OK in a hundred years or so goes beyond optimism right into delusion. # 81, Russell, I am not familiar with Ionospheric refraction, these ducts exist at 10 to 500 meters above sea level,in the troposphere, right below manly isothermal layers within steep inversions. Re #74: Ray, I still see the “no warming since 1998” line spouted out here and there. A quick write up and a nice graph showing that, even with 1998 being such an unusually warm year, the average temperature has still risen .2 degrees in the 10 years from 1998-2007, would be a nice retort to such posters. A question tangentially on topic: If a major source of the atmospheric transport is water vapor condensing to “clouds and snow” in the mid-upper Arctic troposphere, why doesn’t the snow, etc. mitigate the “snow melt” and in turn maybe the ice recession? ps I omitted (though it may be obvious anyway) that the release of the latent heat in the condensation is billed as a major source of the troposheric temperature rise…. Rod, re “why doesn’t …” consider the quantities involved …. There’s more snowfall at higher elevations in Greenland, but the total mass balance is still negative, for example. It is a joy to see Gavin’s and whole team’s work recognised by the Guardian as part the group of 50 people who can save the planet. In the course of writing our book, Apollo’s Fire:Igniting America’s Clean Energy Economy, we kept running into people on the cutting edge of technology who depended upon Real Climate both for baseline info and interpretation from an objective source. When people in the scientific community step up to the plate and help the broader community really understand the science involved, it is of inestimable value to us who are trying to move the ball in Congress. Great Work! The real culprit in this story seems to me to be Borenstein’s exceedingly sloppy AP story, perhaps nudged along by something badly phrased said by Graverson in the interview. The actual statement in the article, which Gavin fairly calls into question, is pretty ambiguous, which is its main fault. I can see a reading of their prose that is fairly innocuous; when I talked to one of the authors in Stockholm earlier this fall, he expressed a clear interest in looking at the AR4 archive to see if the effect is there. That suggests strongly that there wasn’t any a priori assumption that models are wrong about this. Regarding the ambiguity of the phrasing, remember these are Swedes writing in English, and while Swedes are outstanding linguists (coming from a small country where hardly anybody outside speaks their language) nuances are the hardest thing to translate. On top of that, Nature has its own copy-editors who in my experience sometimes change the meaning in their efforts to “improve” the understandability of the prose. Authors get to see this, but they have to flag it and complain if something goes awry. I’ve asked one of the authors I know to comment on their intent here. They’re good scientists, and I’m sure they did not intend any harm. Now, let me emphasize the really remarkable thing about this result, if it holds up. The neat thing is that the heat flux increases even though (through polar amplification) the temperature gradient is weakening. My first reaction was “aha, latent heat!” but Michael Tjernström (back in September) told me they looked at that, and it’s mostly sensible heat increases doing the trick. That means there is some really interesting dynamics going on — some effect of changes in horizontal shear, maybe some feedback from lapse rate changes, maybe something associated with poleward migration of storm tracks. I really hope this result holds up, since if it does that’s more cool work to be done by dynamicists in understanding what is going on. Think of the possible repercussions for the unsolved problem of maintaining an ice-free state in the Cretaceous! Needless to say, I am extremely pleased and impressed that congressman Jay Inslee checked in to congratulate Gavin on his well deserved recognition. If members of Congress are checking in on Real Climate, perhaps there is some hope that this country might develop some policies necessary to deal with this problem! Got ,Wayne- the question is one of the acceptance angle for emitted IR ray paths refracted from under the horizon through a near surface mirage inversion- So I can assume a few % density contrast per 10 Kelvins. given that statement, what would you say about my comment #48 (And gavin’s response?). Gavin’s explanation makes sense, and would probably be a quick hypothesis I would give if my professor asked me. I would not think that sensible heat is sufficiently strong here, but this is interesting. Talking about high profile papers, has anyone got anything on the alleged prediction by the Russian academy of science that solar cycles 24 and 25 will take us straight back into a little ice age, and there will be no/ very few sunspots? It looks very dodgy, but of course denialists are starting to use it as an excuse not to do anything, never mind the small problem of ocean acidification. From the Hadley/CRU surface temperature record. The Hadley surface temperature anomalies for this century so far (i.e. 2001-2007) are as follows: 0.40, 0.46, 0.47, 0.45, 0.48, 0.42, 0.41 (up to Nov). Whitehouse (whoever he is) therefore appears to be correct in his statement regarding the lack of significant difference between the years, though he may be a bit premature in declaring that the “warming is over”. The prediction was that there was a 60% chance that the 1998 record of 0.52 deg C would be exceeded in 2007. The actual prediction was for an anomaly of 0.54 deg C (0.38-0.70; 95% CI). If they’re lucky the final value for the year will just fall inside the low end of their specified 95% confidence range. We can assume, therefore, that Hadley thought there was something less than a 5% (nearer 2.5%) probability that the global temperature would be as low as it actually is. Everybody is obsessed by storms. They are spectacular, do a lot of damage and transport plenty of energy. Good reasons. I am obsessed by a semi-permanent blocking high that seems to steer those storms over much of the north. Like hurricanes, storms do not have a will of their own but move in paths determined by their surroundings. In America for some reason the jet stream is frequently mentioned, in Europe very seldom, if ever. There is a nearly permanent area of high pressure over Siberia and Central Asia. For some reason last summer this fair weather expanded or moved to cover much of the Arctic, and was instrumental in the exceptional sea ice melting (with other factors). Most of time the western edge of that same blocking high determines if the Atlantic depressions hit Europe or pass it by on a more northerly track. How far west the high extends and the shape of it largely determines the type of weather in Europe. Some ten years ago there was an impressive display. A train of rather compact Atlantic depressions passed over France, proceeded the length of a hot Mediterranean picking up humidity, hit a stonewall north of Turkey and was forced on an unusual path towards northwest. The result was a week of torrential rains in southern Scandinavia and extensive flood damage. Why is this high there in the first place? I do not know, maybe something to do also with plain geography. The Americas have the Rockies and Andes, running north to south. Eurasia has mountain ranges running from east to west, China to Spain. Features that reach to mid-tropospheric heights. Warming surely affects everyday weather. Still, IMHO it is simply not knowable what the exact impacts are on a daily and local basis. Maybe changes of a semi-permanent, large and influential feature could be more tractable. Also even a slight expansion to the west would steer more Atlantic storms (and their energy) to the Arctic – a possible feedback mechanism. A national newspaper, a Conservative bent, no class nor scruples, a readership of 100,000s. That’s why its important. > latent heat … sensible heat …? … low-level jet streams … form in stratified flow downstream of the vertex of large elliptical barriers such as the southern tip of Greenland, hereafter referred to as “tip jets”. The tip jet dynamics are governed by conservation of Bernouli function as parcels accelerate down the pressure gradient during orographic descent. In some circumstances, the Greenland tip jet is influenced by baroclinic effects such as differential horizontal (cross-stream) thermal advection and/or vertical shear. In contrast, in the barotropic situation upstream flow is diverted around and over the obstacle into laminar (Bernouli conservation) and turbulent (Bernouli deficit) regimes, respectively. In both situations, a downstream geostrophic balance is achieved, characterized by baroclinicity and vertical shear associated with the surface-based tip-jet front. … Enhanced surface-based forcing of the ocean circulation occurs in the region of the tip jet core through large air-sea energy exchange (upward surface-heat fluxes > 800 W/m-2), and at the tip jet flank …. 800 watts per square meter heat flux is interesting, isn’t it? CAN GAVIN SAVE THE WORLD? While this paper notes the applicability of the effect to other locations (e.g., Antarctica) it neglects to note that Greenland is unique in that it has two tips generating vortices. I suppose this was less of an issue then, as the sea ice reduced heat exchange between the Arctic Ocean and the atmosphere. Now that there is less sea ice, the heat fluxes associated with the northern vortex are – larger.. The Guardian fails to fully realize that the description of a problem, does not directly equate to the solution of that same problem. Their choice of using the phrase “save the planet” implies we are on the “solution side of the problem”, instead of the “description side of the problem”.